Metropolitan Sewer Subdistrict, dba MetroConnects, will honor Charles F. Styles for 36 years of faithful service as a commissioner during a retirement celebration to be held at 2 p.m. Thursday, Dec. 6, 2018 at MetroConnects, 120 Augusta Arbor Way. 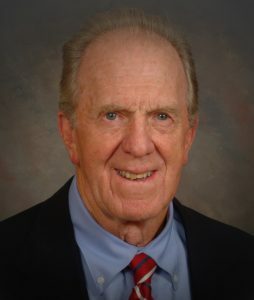 A native of Travelers Rest, Mr. Styles received his bachelor’s degree in business from Furman University in 1958 and served as a pharmaceutical sales representative for 39 years, retiring in 1999. Active in the ROTC at Furman University in 1958, Mr. Styles went on to serve in the U.S. Army Reserves, retiring from active duty in 1989 having achieved the rank of Colonel. A civic-minded citizen, Mr. Styles served two terms on the Travelers Rest City Council during the time the city installed its sewer system, which is still in operation today. After his second term expired, Mr. Styles was elected to two terms on the Greenville County Council. Mr. Styles said that when he first joined the Metropolitan Sewer Subdistrict Commission, Metro employed only three people. During his service to Metro, the subdistrict has grown its sanitary sewer system to more than 651 miles and now employs 40 full-time staff. Mr. Styles and his wife, Donna, have two children, three grandchildren and two great-grandchildren. He is a member of Travelers Rest First Baptist Church. MetroConnects is a special purpose district created by the State Legislature in 1969 to operate and maintain sanitary sewer collection facilities. The collection system transports wastewater from area homes and businesses to ReWa’s trunk lines and wastewater treatment plants. MetroConnects’ 168-mile service area stretches from northern Greenville County to the southern portions of the county and southwest to Piedmont in both Greenville and Anderson counties. For more information, visit www.metroconnects.org.